Uwingu's new service, Daily Space Explorer, emails subscribers a new space or astronomy photo every day of the year. They've invited the public to name exoplanets and radio messages to Mars. Now, the space-research funding company Uwingu is offering to deliver the universe to your inbox every day for a year. Daily Space Explorer, Uwingu's new subscription service, emails its members a new digital high-definition space or astronomy image each day. Selected by Uwingu's experts, each photo includes a detailed, informative caption and a forum to discuss the image with other subscribers. "If you love space, you will love this beautiful daily dose of it. Beautiful images of space missions, personalities, space history, planets, and the far away cosmos," said planetary scientist and Uwingu's CEO Dr. Alan Stern. "Each image is curated by space lovers for space lovers." Stern has experience delivering stunning space images to Earth. As principal investigator for NASA's New Horizons mission to Pluto, he led the historic flyby in July of this year that captured the first close-up views of the dwarf planet and its four moons. Daily Space Explorer, which sent out its first photo on Dec. 12 (a Hubble Space Telescope view of the Carina Nebula), featured a New Horizons' image of Pluto one week into the service. Titled by Uwingu "Blue Skies Over a Cold World," the night side image revealed the glow of the planet's thin atmosphere. Other images selected by Uwingu have included "coronal loops" jetting out from the Sun, rover tracks left by NASA's six-wheeled Curiosity on Mars and a super typhoon on the Earth as seen from the International Space Station. "Having problems thinking of holiday or birthday gift ideas for children, friends, teachers and colleagues? 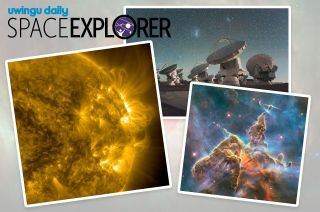 Daily Space Explorer is perfect," said Uwingu's Ellen Hall. "Send them a daily dose of space eye candy. "With an informative caption they can learn from, this gift will keep on giving for a whole year," she said. Like Uwingu's other projects, which include naming craters on Mars, half of the proceeds from Daily Space Explorer will go to "The Uwingu Fund," which underwrites grants for researchers and organizations. Uwingu ("sky" in Swahili, pronounced "oo-wing-goo") has to date funded projects by Astronomers Without Borders, Students for the Exploration and Development of Space and the SETI Institute, among others. In addition to space and astronomy imagery, Uwingu also plans to feature exclusive space art as a part of the Daily Space Explorer deliveries. Each day's entry, whether art or image, can also be shared on social media. "Now anyone can share in the excitement and beauty of space exploration, every single day!" stated Henry Throop, Uwingu's staff planetary scientist.